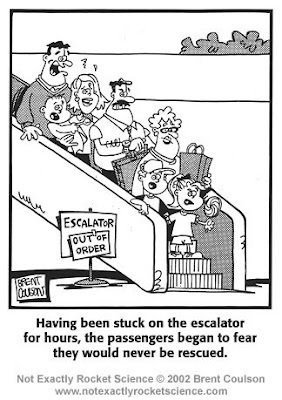 Thought - The electric escalator always moves at the same speed. Why? As not to create uneasiness amongst the passengers. Why would this happen? If full (and not equipped with a constant-speed system) the upwards movement could be delayed and/or stopped causing general anxiety in the group. So? The engineers calculate the speed the escalator would move at if full and set this speed as the constant one. yo lo leí antes que nadie, cuando te fuiste al baño a dormir tu siesta "para llamar la atención de todos"